Well, fall is upon us which means the holidays are right around the corner. If you’re anything like me, you dread all of the extra treats that become so easily available during this time of year. I don’t know about you, but I’m already looking to get a head start on keeping off those holiday pounds! Sign up for one (or all!) of these races today to help keep yourself accountable and active! I’m already signed up for the October 22nd race, so maybe I’ll see you there! October 22 :: The PNC Atlanta 10 Miler & 5K. Both the 10 miler and the 5K start and end in Atlantic Station. 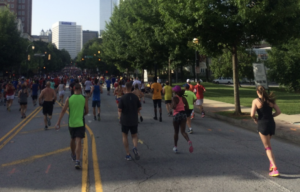 During the 10 miler race you’ll wind through the streets of Buckhead and take on the famous “Cardiac Hill”. All participants receive a long sleeve t-shirt and finishers medal, while awards are given to overall male and female and the top 3 in each age group. This race typically sells out, so sign up today! November 23: The Thanksgiving Day Half Marathon & 5K. The half marathon is the final race of the “Triple Peach” (along with the Peachtree Road Race, ran on July 4th and the 10 Miler, mentioned above). After running through the streets of downtown, you’ll finish this race under Atlanta’s iconic Olympic Rings! Stick around for an after party or go enjoy some well deserve turkey with your family! All participants receive a long sleeve t-shirt and finishers medal, while awards are given to overall male and female and the top 3 in each age group. December 9: The Ugly Sweater 5K Run. This race is the merriest 5K of the year! You’ll run through Piedmont Park in your ugliest holiday sweater! After the race, participants will enjoy getting to shoot marshmallow guns, playing in fake snow, and hanging out in a life size snow globe! All participants receive an Ugly Sweater Run knit hat and a finisher’s medal. Awards will be given for best ugly sweater and many more! You definitely won’t want to miss this! And if you’re in the market for a new home to host the holidays in, call The Peters Company at 678-921-1470. There’s still plenty of time to get you nestled in before the end of the year! ← Real Estate Agent vs REALTOR® – What’s the Difference?